Paul Goldschmidt's tiebreaking homer on a 3-0 fastball from Chris Hatcher with one out in the eighth inning helped the D-backs to a 4-2 win over the Dodgers on Tuesday and spoiled Vin Scully's final home opener in the Dodger Stadium broadcast booth. "It's a tie game, I'm just trying to find a way to get on base," Goldschmidt said of his homer. "Fortunately I was able to get it out of there. It was a good job for us to be able to tack on a few more, and the bullpen did a great job. So did [Patrick] Corbin. All and all, it was a good win, and we were fortunate to come from behind like that." Dodgers rookie Kenta Maeda, who also threw six scoreless innings in his Major League debut last week in San Diego, held Arizona scoreless over six innings on five hits while striking out four. "Maeda was great; he has so many weapons," said Dodgers manager Dave Roberts. "After six innings and 95 pitches, I thought that was a good time to go to the 'pen and give Petey [Pedro Baez] a clean inning." Nick Ahmed tied the game with a two-out solo homer in the seventh inning off Baez. Corbin allowed one run in six innings for the D-backs, with Tyler Clippard getting the win in relief and Brad Ziegler the save. Howie Kendrick, activated off the disabled list for the game, led off the second inning for the Dodgers with a single, took second on Trayce Thompson's infield single, tagged to third onCorey Seager's flyout and scored on A.J. Ellis' perfect bunt. Goldschmidt drove in an insurance run with an RBI groundout in the ninth after Socrates Brito hit an RBI triple. 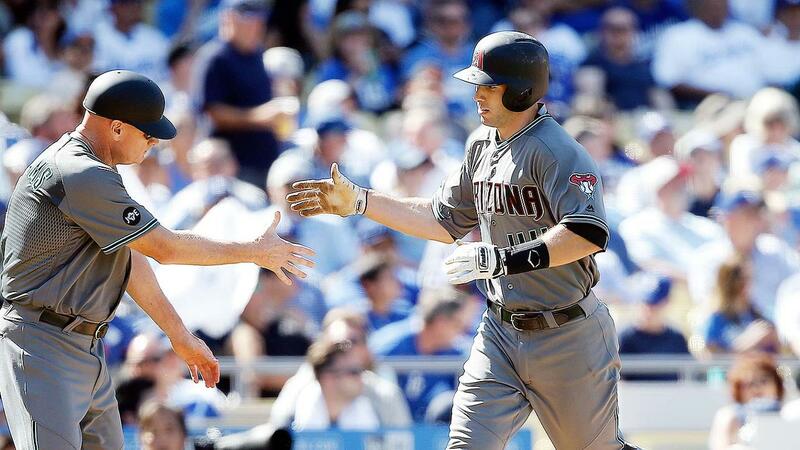 Gold standard vs. Dodgers: Something about facing the Dodgers seems to bring out the best in Goldschmidt. Including Tuesday's 1-for-5 effort, he has hit .338 against the Dodgers in his career, with 22 homers and 65 RBIs. Dodger Stadium has also been a friendly place for him, as he hit .450 with five home runs at Chavez Ravine in 2015. The home run was the first of Goldschmidt's career when the count was 3-0. Great escapes: Arizona had runners on second and third with no outs in the second inning, but Maeda struck out Yasmany Tomas, then got Corbin and Ahmed on grounders. With two out in the sixth, Welington Castillo singled and was thrown out at home on Jake Lamb's double, Yasiel Puig's throw relayed by Justin Turner to Ellis. Slow going: Castillo is not known for his speed, and his lack of it cost Arizona on the basepaths a couple of times. After Castillo led off the second with a single to center, Lamb doubled to right-center, but third-base coach Matt Williams had to hold Castillo at third. Then in the sixth with two outs, Castillo was thrown out at the plate trying to score on Lamb's second double of the game. "That was a correct decision by him," Hale said of Williams. "He had to take a shot. They did a really nice job of the cutoff and relaying to throw him out at home." Streaking Seager: Seager led off the bottom of the ninth inning with a double and scored on a groundout. The double extended the rookie's hitting streak to 11 games dating back to last year. Maeda joined Karl Spooner (1954) and Kaz Ishii (2002) as the only Dodgers to begin a career with two scoreless starts, according to Elias. Puig singled to left in the fifth and stretched it into a hustle double. Tomas' throw to second was a little offline and pulled second baseman Jean Segura off the bag. Puig slid by the bag and reached back to tag second with his hand. Meanwhile Segura, also on his stomach, reached out to try to touch Puig's hand. Puig was ruled safe and the D-backs challenged the call. After a three-minute, 51-second review, the call stood. D-backs: Rubby De La Rosa will get the start at 7:10 p.m. MST Wednesday night against the Dodgers. De La Rosa, who came up through the Dodgers' organization, struggled mightily against them in 2015, compiling an 11.21 ERA in four starts. Dodgers: Alex Wood makes his second start in the 7:10 p.m. PT game on Wednesday. Against the Giants, he threw four scoreless innings, then allowed five of the next 10 batters he faced to score. He had a 7.13 spring ERA.